Y’all, tacos might as well be my love language. If something is wrong in my world, tacos can make it right again. I could eat tacos probably every day for a year and never get bored; there are so many delicious, different kinds!! I seriously love tacos. This should help you understand my joy when a long-time friend of mine said he would take me on a taco tour when I was in Phoenix for a conference this month. Hallelujah and pass the salsa! I was curious to find out if and how tacos would be different in Phoenix than in south-central TX, given the influences of different parts of Mexico and New Mexico. Investigation in the name of food and bringing you all gems of the taco scene in Phoenix? Well, don’t mind if I do! The first place we went was actually on a PBS show called “Check, Please!” so we were excited to explore a restaurant that had been on television. Courtesy of Erin, one of my Phoenix friends, here is the clip from Arizona’s “Check Please!” so you can see a little more about the restaurant if you wish. 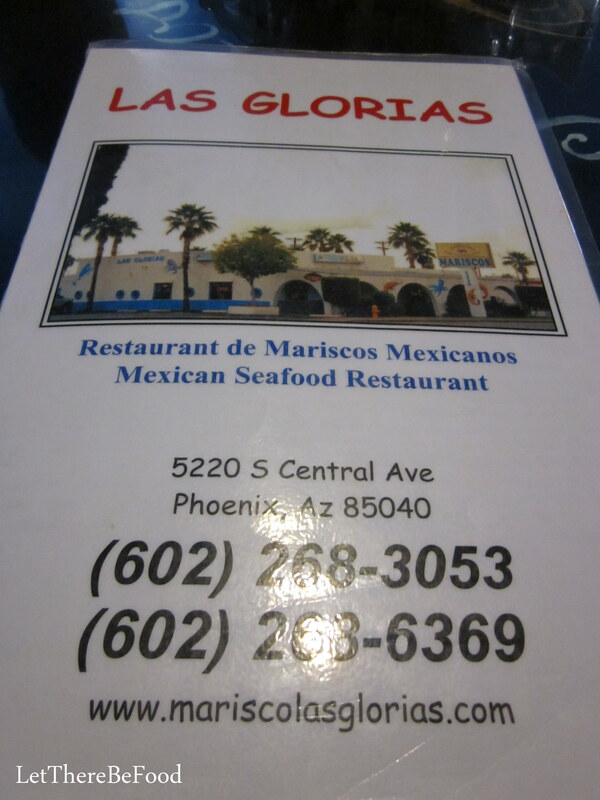 Las Glorias is primarily a seafood restaurant, and does look a little bit like a hole in the wall. In case you aren’t hip to this piece of information, let me tell you that being a hole in the wall usually bodes very well in the Mexican-food world. Get in there and get you some! Las Glorias takes their seafood atmosphere quite seriously with blue walls and ocean decor everywhere. 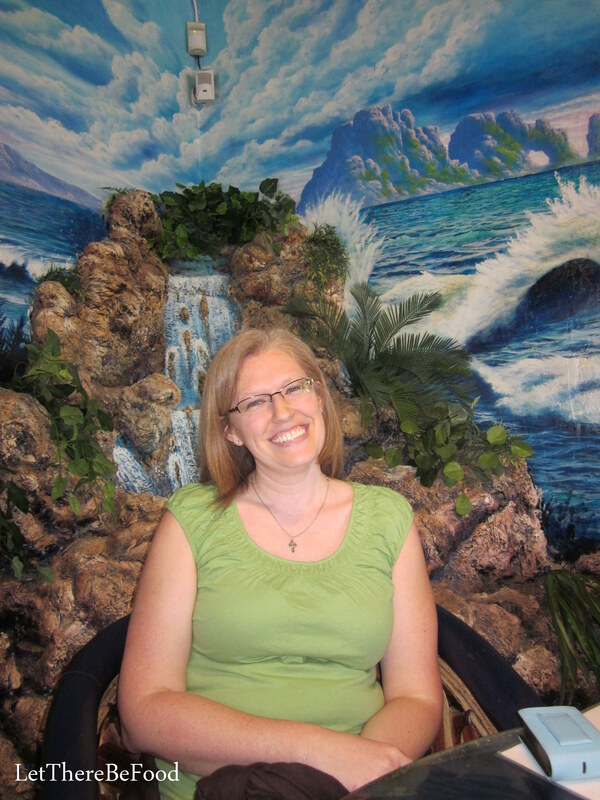 We got to sit in front of the faux waterfall, which was lovely. There weren’t many tacos on the menu, honestly. However, it was an extensive menu of many tasty-looking seafood options. My girlfriend, Stacey, and I decided to split the fish taco plate that came with rice, beans, and three tacos, and I got an additional ceviche tostada. The food came out pretty quickly, and it all looked so good. 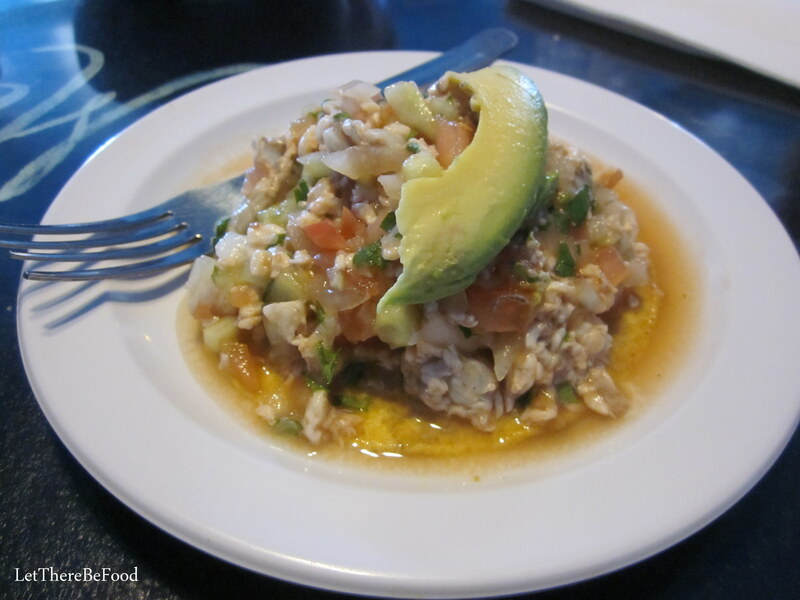 My mixed seafood ceviche tostada was a crisp corn tortilla with a huge mound of mixed seafood with sliced avocado on top. 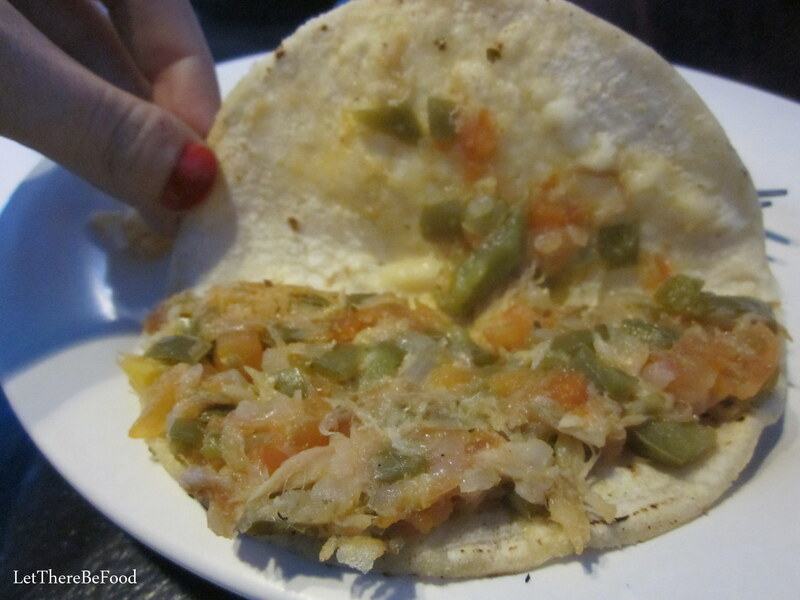 It was sitting in a pool of tomato/seafood water which made me think my tostada would get soggy; however, it did not. Perhaps it didn’t have time because I ate it so quickly, or maybe it was just that crispy. Either way, it stayed crispy all the way to the end. The seafood was fresh and the mix was quite the variety. When I shared a chip-full with Stacey, I noticed some fish, shrimp, and octopus on there. Well done, Las Glorias. 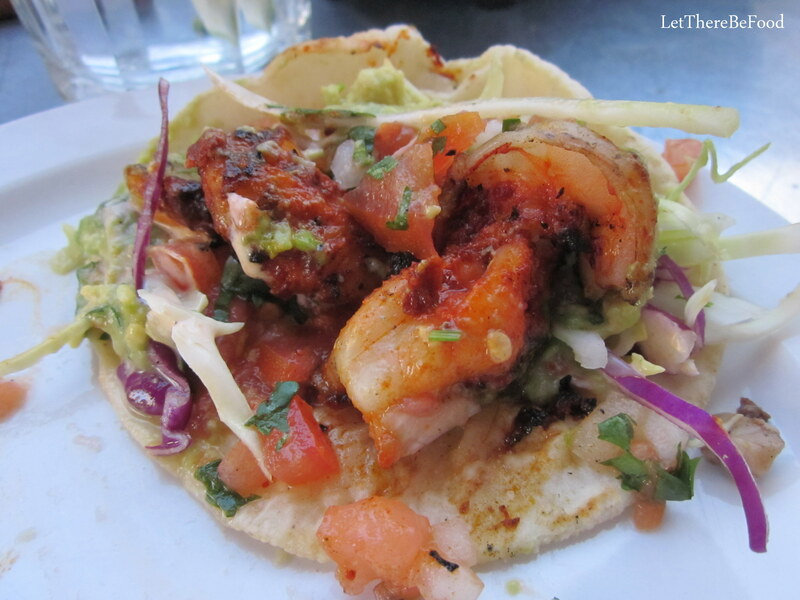 At the same time, the fish taco was unlike any fish taco I have ever eaten. I assume that most of you pictured a battered piece of fish with some coleslaw on top when I said we ordered fish tacos. Well, friends, please take a gander at the inside of our fish tacos. Yep. Isn’t that something different? I was certainly surprised when they came out. The tacos were still good and had quite a pleasant fish flavor, but the vegetable flavor was also fairly strong for my taste, at least for a fish taco. There is something about having an expectation that just isn’t quite met, you know? I appreciate that my fish taco horizon has been expanded, but ultimately I think I still prefer the traditional battered fish with coleslaw. I might experiment with making my own tacos in their style sometime to see if it grows on me. I’ll keep y’all posted. The second place we went to, that we ended up visiting a second time, was most amazing. Friends, Gallo Blanco Cafe & Bar has a happy hour that includes tacos. A taco happy hour!?!? I was meant to eat at this place! Gallo Blanco is a cute restaurant attached to the most delightful retro hotel just a touch off the beaten path. 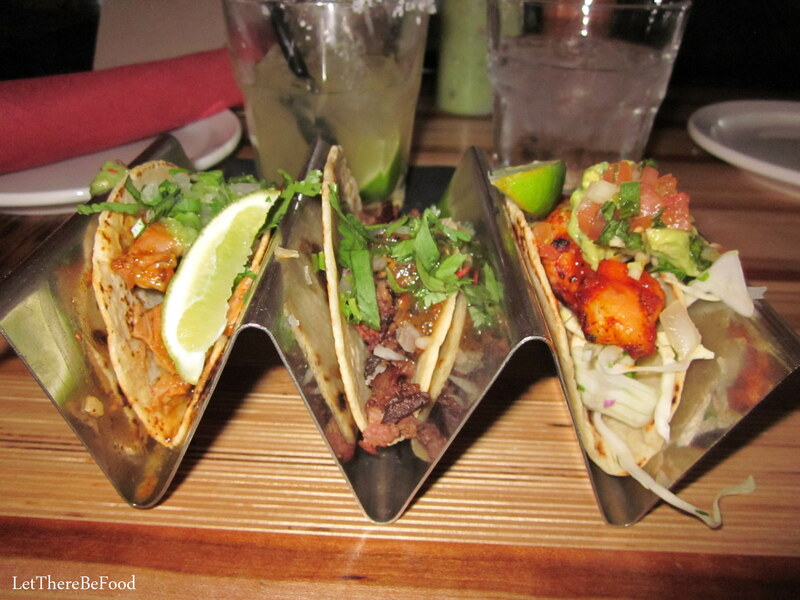 Along with drink specials, their tacos along with a few other appetizers have a discounted price from 3 – 6 every day. Yes, dear friends, EVERY DAY. Well, there is one exception. This fabulous deal takes place all day long on Tuesday. It’s probably best that I don’t live in Phoenix, or I might never eat anywhere else. When we went on Sunday, I got a cochinita (pork) taco and a carne asada (beef) taco. 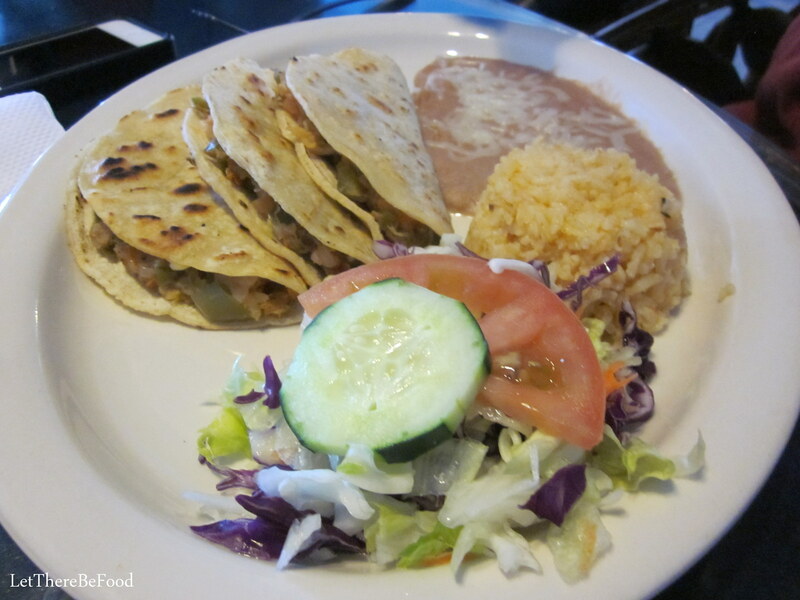 Their tacos are known as “street tacos” so they are smaller than you might typically see. 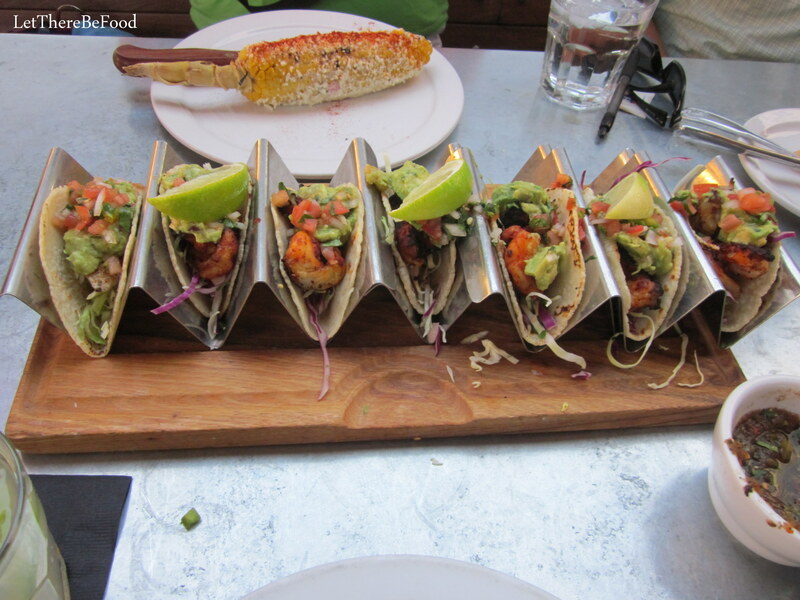 Everyone else in my group got the shrimp tacos and could not stop ooohh-ing and aaahh-ing over their tacos. Mine were very tasty, but I must admit, I was a little curious what all the fuss was about. 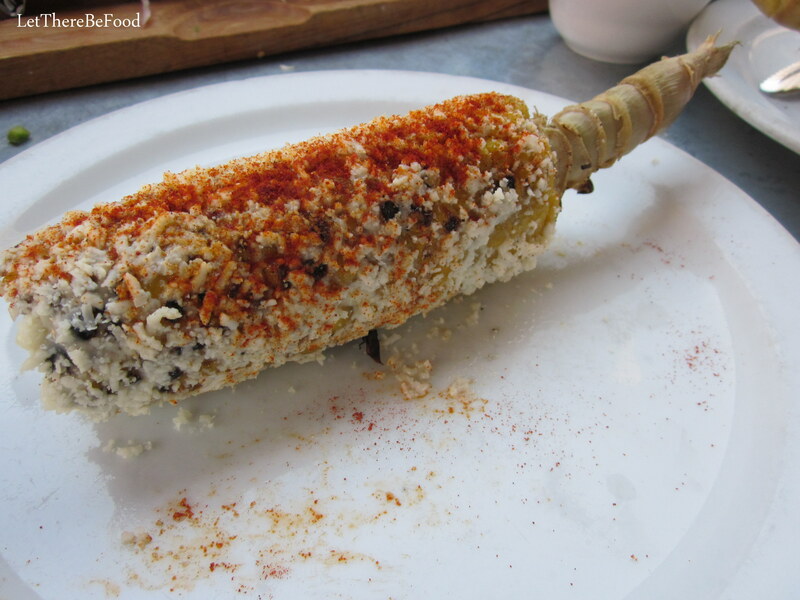 Stacey also ordered the elote callejero or grilled corn with cotija cheese. Thankfully, she was kind enough to share three or four bites with me. “Mmm-mmm, good” is all there is to say about that! It wasn’t even two hours after my Phoenix friends dropped us off at our hotel that I got a text that said, “Do you have dinner plans tomorrow night? We want to go back to Gallo Blanco.” Hilarious! I had just made dinner plans, however, so we made plans to go Wednesday night after our official business was over. Upon our return to Gallo Blanco, I surely did order some shrimp tacos and my own elote, stat! We ordered so many tacos that night. Oh my word, that corn came out so warm from the grill that the cotija cheese was melty-soft on the corn, with a touch of paprika and a little smoky flavor. Thank goodness, we all had our own ears this time around because nobody was in the mood for sharing. It was crazy good. And those shrimp tacos?? My tacos on Sunday were good, y’all, but these shrimp tacos were out of this world. They tasted like a summer afternoon out by the pool with the grill fired up on the porch. Smoky, fresh, flavorful, just a little spicy with a touch of guacamole to cool it all down. 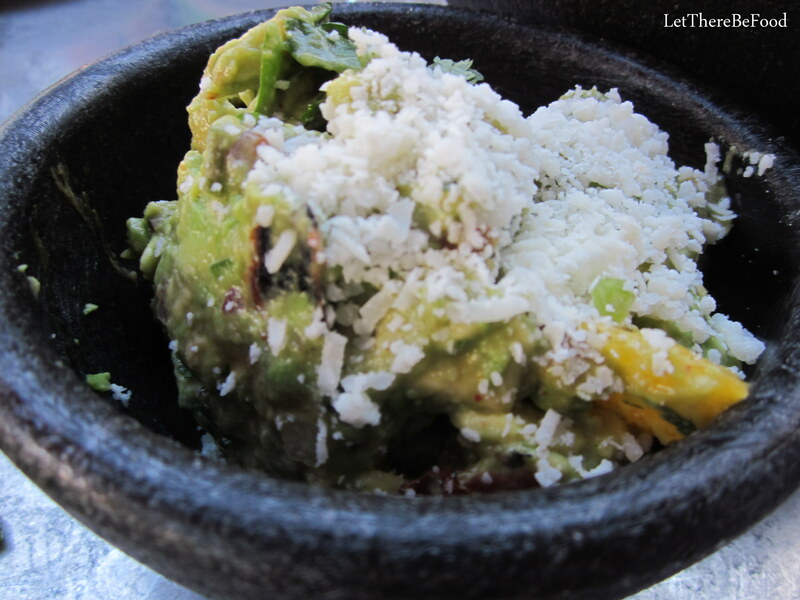 Speaking of their guacamole, we also tried some because it was on happy-hour special. If you have been following my blog for a while, you may remember my adventures with goldamole in Philadelphia last year. This one was priced as guacamole should be, friends. 🙂 It was not quite your run of the mill average guacamole, either. It was a citrus guacamole with pieces of what I believe were either tangerines or clementines (based on size) mixed in, and covered in cotija cheese. Gallo Blanco sure does love the cotija cheese! I quite enjoyed the guacamole. To wash everything down, I enjoyed one of their happy hour beverages, the El Julio. You can check out the menu to see what is in an El Julio, but let me tell you it tastes sort of like a Lime Julius might taste. Do you all remember the drink Orange Julius? Well, this is what I think the lime version would taste like. It was frothy and a little creamy tasting without any cream in it, and limey without being sour. Muy delicioso! 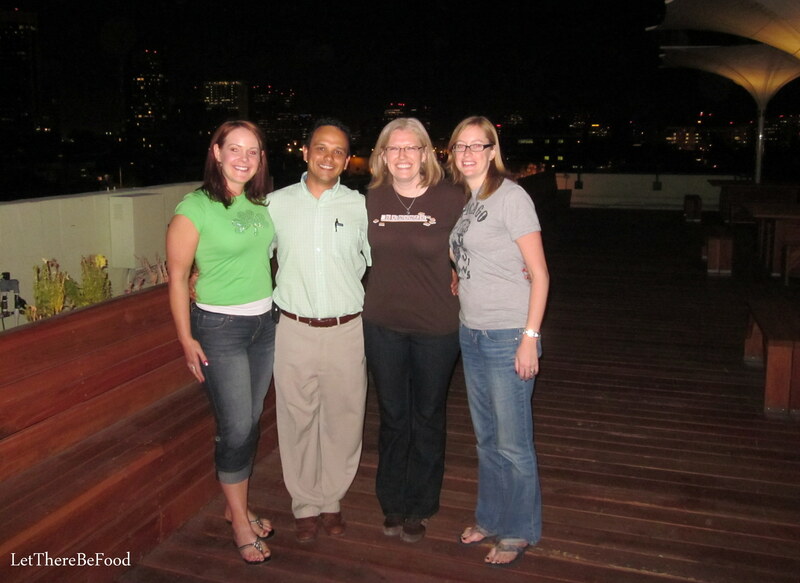 While my Phoenix Taco Tour ended up only being two places, I deem it a success! We ate at a place that has been on television and found a taco happy hour good enough to visit twice in four days. If I’m ever back in Phoenix, and I hope to be some day, I’m totally going back to Gallo Blanco. Please trust me on this one. If you find yourself in Phoenix between 3 and 6 on any given day, you should make haste to 401 W. Clarendon. I promise you won’t be sorry. Order a shrimp taco, elote callejero, and an El Julio and be a happy camper. After that, feel free to order whatever else you like because you just can’t go wrong. Up next are all the other tasty eats I had during the rest of my trip. Stay tuned and happy eating!